What Will I Be Getting Inside This Course? 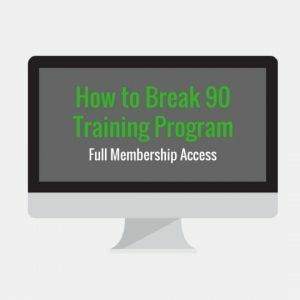 The Break 90, Break 80, and Break 70 Plans are easy to follow and will keep you disciplined during practice to maximize your time so you get better quicker! As you complete these step by step practice plans utilize our custom worksheets to track your results and see instant progress over the course of a few weeks. Take advantage of our sale and order all 3 practice plans ($75 individually) as a bundle package for only $125! Yes, get all 3 for just $125 instead of $225! Each plan is 36 practices covering a wide variety of drills to improve your golf skills as efficiently as possible. Take your game next level by getting all 3 plans plus worksheets, bonuses, private Facebook group, and private access to Nick ($500 value) for just $125. 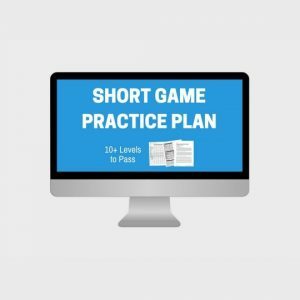 Explore 35+ pages of content that teaches you important lessons on short game as well as statistic based performance improvement. We’ve designed countless charts and diagrams to show you where you stack up against fellow golfers in your handicap range. You’ll learn exactly what you need to achieve statistically in different categories of the golf game to lower your golf score to a level you’ve been striving for. 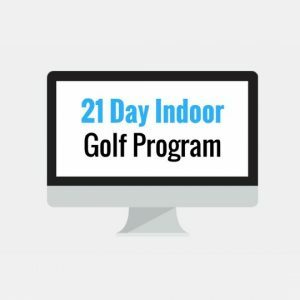 We’ve created 3 different 12 week improvement programs because there are 3 major groups of golfers. Each program includes 12 weeks of practices that build off of each other each week getting more challenging. This ensures you are improving and keeping up with the program. We’ve included worksheets that go with each and every practice so that you can show up to the course with your workbook and fill out the practice sheets as you complete drills. Tracking your results will be vital to your improvement. Get access to our custom scorecard which has stat tracking for fairways hit, greens hit, scrambling conversions, putts per round, putts per green in regulation, and more! You’ll know exactly how often you hit fairways and greens (60% or better is good) as well as detailed short game statistics. This will give you intel on what to work on more during your practice time. We also included 5 different PDF files to download that give you bonus drills to help you with the golf swing, putting, chipping, and your mental game. Use them to create your own custom routines based on the stats you’re seeing out on the golf course from our custom scorecard. Does any of the follow sound familiar to you? Practicing like crazy with little result. You’re throwing a lot of time and money into your golf swing, equipment, balls, and training aids but seeing little to no improvement in your scores. Unsure how to spend your practice time. You’ve got limited practice time each week and every time you go to the course you’ve got good intentions of working hard but end up leaving feeling unaccomplished. Losing your motivation. You feel like you’ve tried every golf drill on Google, but haven’t seen the results you were expecting or the improvement that allows you to break that next scoring barrier. Frustrated by all the conflicting information. You’re sick of wasting time trying to research how to fix your golf swing, improve your ball striking, and sink more putts. You keep hearing the same outdated, lame-sauce advice. You want something that will work NOW! Did you raise your hand to any (or all) of the above? Good. You are SO in the right spot. Dramatically improve your chipping skills in less than ONE week. Consistently strike quality chip shots that land on the green and roll close to the hole. No more missed opportunities to get up and down for par. Sink more putts within 10 feet. Stop sweating those par saving putts from a few feet away from the hole. You’ve built a putting stroke that is your strongest weapon, helping you make more birdies, pars, and shoot lower scores. Feel confident in your golf game. No more second guessing or feeling pressure standing over your golf shots. You know you have the skills to play well and the mental confidence to back it up. Stand out above the competition. Your golf game becomes noticeable when playing with friends, getting you lots of new compliments and putting fear in your competitors. Continually improve your golf skills without spending tons of money. You are actually able to see improvement on a weekly basis without spending loads of money on your game. Feel excited to practice your golf game. When was the last time practicing golf was actually fun and didn’t feel like a chore? Now you have exciting drills and games to look forward to completing, making you want to head to the course for practice! Get this, bud — you can achieve ALL of this success by simply practicing more strategically. 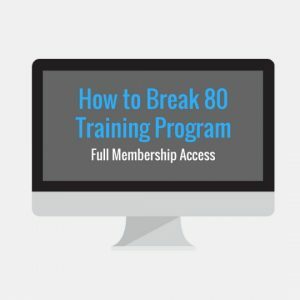 These Practice Plans (Break 70, 80 and 90) are my step-by-step program and online community where I’ll teach you my highly effective Golf Practice SYSTEM, so you can stop spinning on that hamster wheel and start improving your golf scores, fundamentally and QUICKLY. Discover ALL the practice drills I’ve taught to over 1,000+ other Program students — practice plans that will dramatically improve your scoring, chipping, and putting fast. This is the same system I used to break 80 in golf within my first few years of playing golf and eventually go on to win golf tournaments with under par scores. And the best part? I’ll show you how to track the RIGHT kind of statistics — Fairways in regulation, Greens in regulation, Scrambling, Putts per Round, Putts per GIR, and more. We’re not trying to practice blindly here. We want you to see progress and growth and the only way to do so is by having cold hard data to back it up! *Amazing stat tracking worksheets included! Overall, this bundle plan and all the accompanying bonuses will be like no other program out there. If you stick to the plan, read all the material, and apply everything you’re learning to your practices, then I have no doubt you will be an improved golfer and shoot lower scores. Following the 12 week plans alone will be great but I highly recommend consuming all of the bonus we added into this 12 week program. Best of luck! You’ll do great! You have 30 days (more than enough time to take a look through all the content and begin implementing it to see if these practice plans and bonus content are the real deal or not. If you ever feel it isn’t worth your money, let me know and I will issue you a full refund. To date we’ve had 1,000+ satisfied members and I’m sure you will be too!